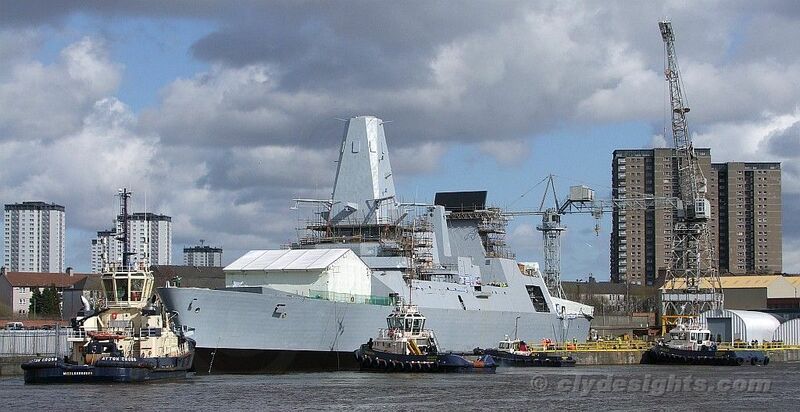 On Thursday 1 April, two of the Type 45 air defence destroyers being built by BAE on the Clyde were moved at the firm's Scotstoun shipyard. First to be moved was the fourth ship of the class, DRAGON (D35). 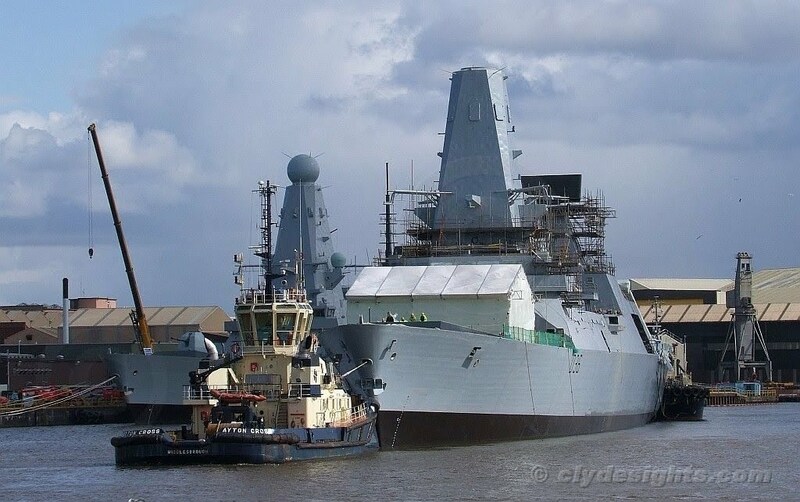 She was floated out of the No 1 Drydock, and with the careful assistance of Clyde Marine Services' tugs BRUISER, BITER and BOOJUM BAY, moved to No 3 Drydock, which itself had been vacated by DEFENDER a few days previously. 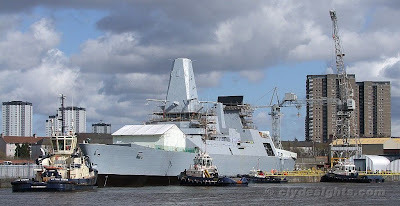 DEFENDER (D36) had been lying alongside DIAMOND, the third ship of the Type 45 class, and which is expected to be embarking on her final trials in the next few weeks. With DEFENDER having been towed the short distance downstream by Svitzer's AYTON CROSS and SVITZER MILFORD, and assisted by Clyde Marine's newest tug CMS BUSTER, this view shows all three Type 45 destroyers at Scotstoun. 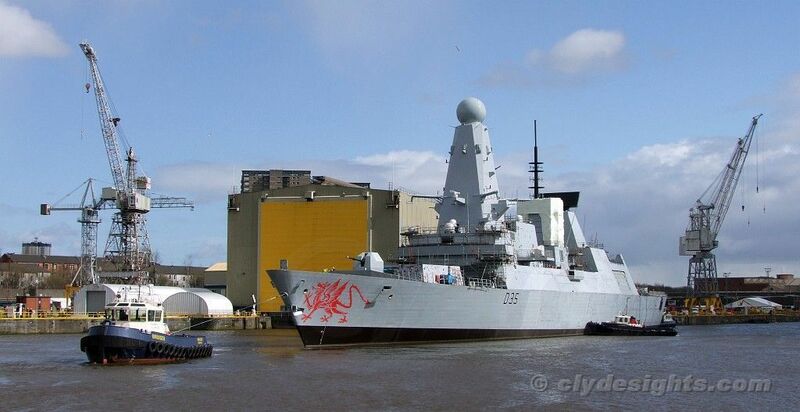 DRAGON now occupies No 3 Drydock. After SVITZER MILFORD was released from the job, AYTON CROSS, CMS BUSTER and BOOJUM BAY, together with BITER still made fast to DEFENDER's stern, eased the ship into the drydock. BRUISER can also be seen against the quay on the right. In all, seven tugs were used - Clyde Marine's BATTLER had also been present, looking after the dock gate from No 3 while the other tugs had moved the ships about. Good to see Svitzer tugs working at BVT. Ensuring the day runs smoothly.